Is Your Home Your Haven? Most of us consider our homes to be a safe, healthy environment, but in reality, our homes are often very toxic places. Given a choice, “Would you prefer to live in “sick” home or a “wellness” home? The answer is obvious, I think we would choose a wellness home. Your first question may be, what is a wellness home? The best way to answer this question is to use an analogy. Think of a greenhouse. It creates the optimal environment for plants to grow. It provides optimal light, healthy air, healthy water, a balanced pH and nutrients. If a plant is not provided with the optimal environment it can still survive but given an optimal environment it thrives. Are we any different? Imagine a greenhouse for you and your family, an optimal environment that provides the tools for your body to heal and protect itself, that is the concept of a wellness home. I am of the opinion if we give our bodies the right tools it can heal and protect itself. Our bodies are amazing. A Nikken Wellness Home is designed to address many concerns, including environmental toxins, contagions, dehydration, poor sleep quality, weight matters and nutrition. In a practical sense, the Wellness Home creates an environment that enables us to make healthier choices every day. In the Self Care Awakening we discuss environmental toxicity and our Body Burden. One of the major factors contributing to our body burden is air pollution. Although we have limited control over outdoor air pollution we do have choices for the quality of air in our homes. Indoor Air Pollution is concern for many health-conscious individuals and with good reason. According to the US Environmental Protection Agency, the air within our homes and other buildings can be more seriously polluted than the outdoor air even the largest and most industrialized cities. We spend nearly 90% of our time indoors. Those who spend most of their time indoors are the very young, elderly or infirm. Pollutants can be 2 to 10 times higher indoors than outdoors. This is especially so during the cold months, when windows and doors are kept tightly shut and homes, schools and office buildings are made as airtight as possible to conserve energy. The air inside our homes is the same air as outside, but we add to the pollution with cleaning products, chemicals from our carpets, furnishings, paints, glues from furniture (i.e. particleboard), and with the other by-products of our modern lives. Dusts, molds, pollens, pet dander and other particles in our air can directly impact us through hay fever or other allergies. Indoor air pollution can aggravate, irritate, and in some cases cause serious harm. The effects of indoor air pollutants range from short-term effects – eye and throat irritation – to long-term effects – respiratory disease and cancer. Improving the quality of our air can reduce the air pollution we experience, as well as helping to reduce airborne transmissions in our homes, offices, schools, and other environments. The KenkoAir® Purifier is designed to combat allergy-causing particles and enhance the air we breathe, helping us to enjoy a more natural, pollutant-free air quality in our homes. When guests first enter our Wellness Home, they often remark that they feel a difference in the air, a calm, fresh feeling as though they were outdoors in a forest or at the beach. There are many choices when it comes to home air filtration units. We recommend the KenkoAir Purifier for the following reasons. 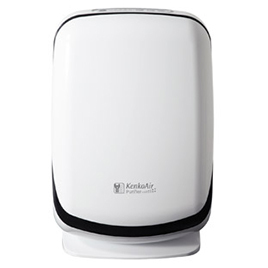 · The KenkoAir Purifier operates without producing ozone. Ozone is classified by the United States Environmental Protection Agency as a toxic gas, yet many other air filtration systems produce it as a byproduct. The State of California has banned the sale of ozone-producing air systems, and other states are expected to follow. 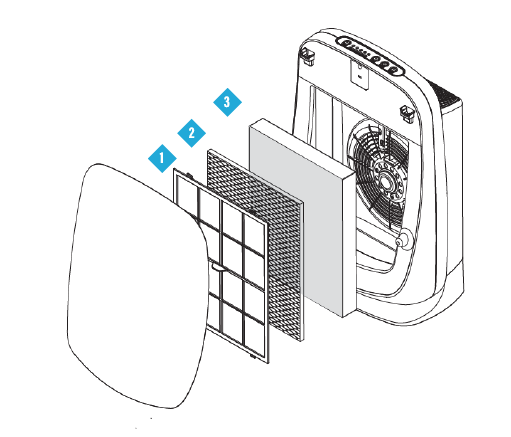 · The Nikken KenkoAir Purifier incorporates multiple-stage filtration including an ultra-low penetration air filter (ULPA). The KenkoAir Purifier exceeds that, with measured efficiency up to 99.9995%. No other home air filtration system matches this level of performance. · This advanced design uses minimal energy. The KenkoAir is Energy Star qualified by the United States Environmental Protection Agency. The Energy Star is given only to an appliance that is at least 35% more efficient than a standard model and saves its owner a minimum of 215 kilowatt-hours per year. · The KenkoAir Purifier costs no more than typical home air systems that do not include ULPA filtration technology and Energy Star qualification. Only Nikken offers all these advantages at a competitive price. Prefilter that removes larger particles present in air as dust, pollen, animal dander, among others. Deodorizing Filter (replaceable), which neutralizes odors such as cigarette smoke. ULPA High Effciency Filters provides a 99.9995% removal of particles as small as 0.12 microns. No other home filtration system matches this level of performance. The Wellness Home is by design and application an easy, effective way to be Heathy by Choice. It offers peace of mind, saves money and gives our bodies the tools it needs to repair, rejuvenate and prevent many health concerns. Early in my career as a Self Care advocate, one of my mentors asked me to imagine our children growing up in a Wellness Home, getting quality sleep, drinking healthy water, breathing pure clean air, receiving optimal nutrition, exercising and maintaining a healthy weight. My conclusion was at the time and still is, we would prevent most of our health concerns. The awesome thing about a Wellness Home is that any home can be a Wellness Home, by utilizing Nikken products and technologies to make your home the healthiest environment possible for you and your family. That’s why we say, “Every home a Wellness Home”.